Our learning spaces are designed to encourage our students to collaborate. They're equipped with built-in technology and can be customised to suit different classes. QUT Law Library, which provides resources and services for students studying law. a helpdesk for assistance with assignments. a Researchers' Centre that provides study spaces for research students and staff. We've designed a range of spaces that encourage collaborative learning and practical problem-solving. 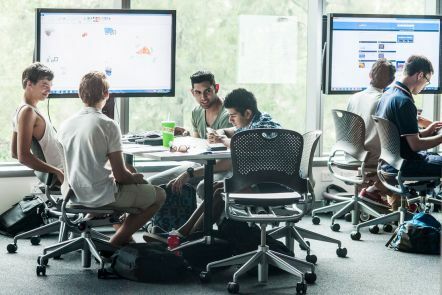 built-in technology that facilitates interaction between students and lecturers, like lecterns with screen-sharing capabilities and computers on wheels (COWs) for student group work. This makes it easier for students to participate in discussions, share ideas, and ask and answer questions. Our science and engineering students gain practical skills in some of the most advanced laboratories and workshops in Australia in our $230 million, purpose-built Science and Engineering Centre. We have dedicated laboratories for geoscience analysis, preparative chemistry, molecular genetics research and mechatronics, as well as flexible laboratory spaces. Our law students can build skills and confidence in mock trials in our moot court. It simulates a real-world court experience, and boasts integrated technology including computers and display screens, international video conference capabilities, video and audio recording, and electronic evidence presentation. Our finance students have access to real-time global financial instruments and data in our securities dealing room. Students get hands-on experience with financial markets, products and trading activities. Our pharmacy students practise prescription processing, product labelling and therapeutic use of over-the-counter medicines in our simulated pharmacy, and use specialist equipment in our compounding and pharmaceutical laboratories. Our medical radiation sciences students treat virtual patients, using 3D glasses to view internal organs and track radiation therapy beams, in our Virtual Environment for Radiotherapy Training (VERT) suite.